From the beginning, Alesund was a picturesque Norwegian fishing port built largely of wood. Then, in one cold night of January 23, 1904, a massive fire quickly spread by a strong wind destroyed almost the entire city leaving nothing but a handful of houses untouched. Perched at the top of Norway’s Western Fjord, picture-perfect Alesund is spreading over several islands connected by bridges and tunnels, stretching into the Atlantic, with the spectacular Sunnmøre Mountains as a backdrop. Its sea houses once used for preparing of fish, today are housing cozy little shops, galleries and hotels, and its streets lined with beautifuly rose, salmon and yellow colored houses, make you hard to believe that such a place once rose from the ashes. After the fire, Alesund remained the most important fishing harbor in Norway and fishermen are still there to sell their catch directly from their boats. Sit awhile and watch the boat traffic because Alesund in not only one of Europe's busies port, it's also a stop on the Hurtigruten route, the fast coastal service connecting all of Norway. Sure, weather is never "usual" here, but May is the driest month perfect for people watching, cruise trips, and outdoor activities on idyllic small islands on the ocean’s edge. In Norway three things are for sure: you are never far away from fjords, seafood, and good coffee that is super important to most Norwegians. 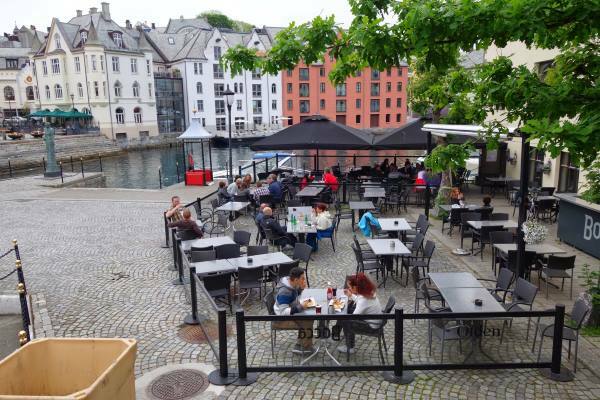 Abundant with restaurants and cafes, Alesund's charming shops and eateries only enhance the total experience. Try "bacalao", a spicy stew of dried cod, the Norway’s most exotic and one of the most requested dishes. Another dish on try list is whale meat. It is illegal to import and sell it in the EU but since Norway lies outside the union it sells free and tastes good, not like fish at all. 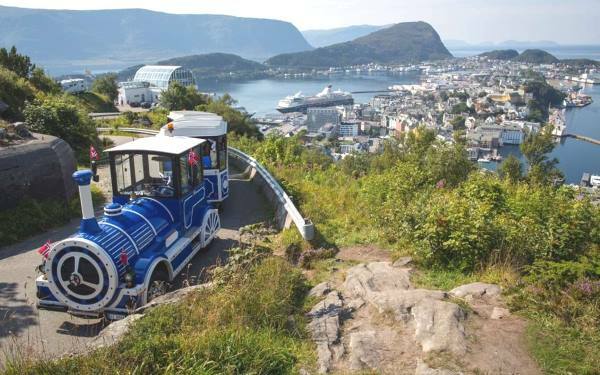 But your first adventure demands ligh breakfast to climb the 418 steps that go up from the Town Park to the viewpoint Fjellstua at the top of Mount Aksla and you will be rewarded by stunning panoramic views. It takes only 15 minutes to get to the top and a climb is not hard at all but the experience on the top is unforgetable. Fjellstua has an outdoor restaurant and café where you can sit and enjoy a cup of coffee and lunch, enjoy the sun and take pictures you will look at and show around over and over again. Art Nouveau buildings reflecting on the water, boats coming and going, canal like waterways cutting through the town, the mountains in the backgound.... Alesund is way too beautiful and the town center is delightful to do on foot. 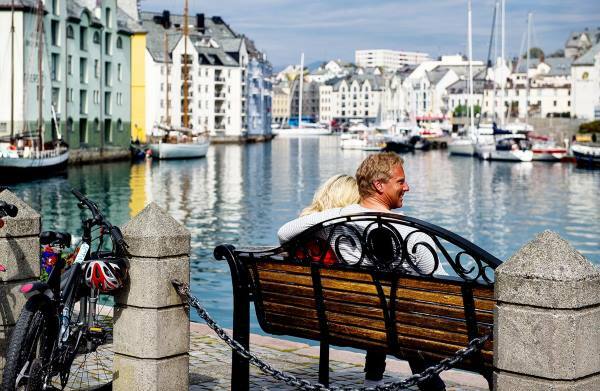 Full of friendly residents, wide selection of shops and exhibitions waiting to be seen, Alesund radiates good vibrations and it is hard to tell what is not so great in Alesund. 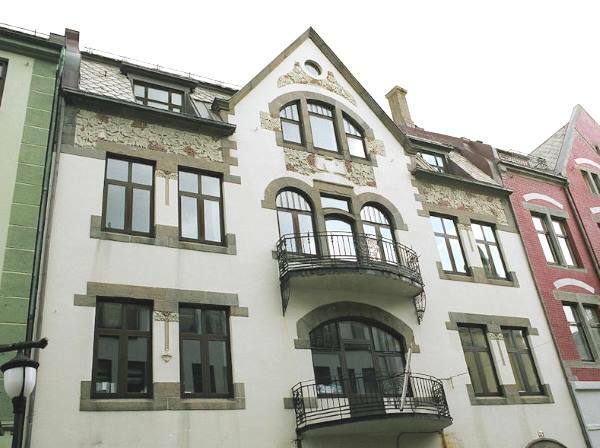 So, lift your gaze while you explore the town and you will discover beautiful details of its architecture. By the picturesque harbor you will find Holmbua warehouse, one of the very few buildings that escaped the 1904 fire, which today holds Aalesunds Museums. The coolest thing in the museum - and the most amazing story behind it tells - an egg-shaped, 18 foot craft which 4 Norwegians sailed across the North Atlantic in the winter of 1904/5. A must see. Sunnmøre Museum is another beautiful open air museum with 55 old and distinct houses where you will feel as if you are put back in time. 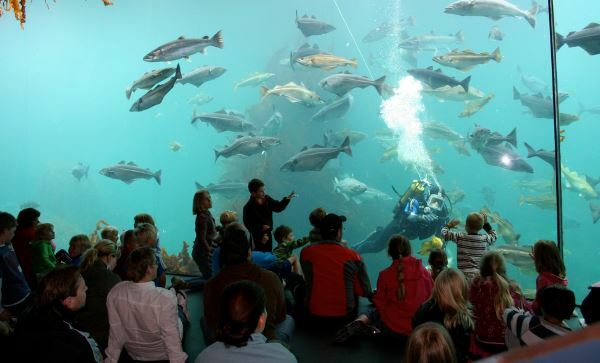 Just a few minutes away from Alesund city centre situated in the midst of a scenic area with hiking paths, you will find Alesund Aquarium, one of the largest saltwater aquariums in northern Europe. The visit includes a spectacular diving show in the largest aquarium tank and feeding of the penguins and fish. After visiting, enjoy Tueneset, a nice green area with walkways and a fascinating view of the Atlantic Ocean. While at walking, orienteering is very popular among Norwegians and a good way if you want to make friends. Did Homer actually see this island?